A chance encounter with a fellow biker resulted in a life changing decision for both me and my wife in April 2014. On the return of a D14 Bantam which I had been asked to re commission for Bill, an enthusiastic biker from West Sussex, I got into a long discussion about what lay ahead for us both. Bill had purchased a farm down in Cornwall which also laid claim to the oldest cider production in the country, 800 years of continuous production on the same farm. As the conversation went on he happened to mention that the local village shop and Post Office were under threat of closure as the current tenant was giving up and there was no one to replace her, he felt this would be a huge loss to the community and knowing the owners well would be prepared to take on the lease if only he could find someone to run it. Well the rest is history as they say; I mentioned it to Hilary who Googled Lerryn as neither of us had ever heard of the village. The following weekend we were visiting relatives in Bude for the Easter holiday so arrange to meet Bill who was in Lerryn for Easter. It took Lerryn approximately an hour to seduce both myself and my wife. Bill said he would contact the owners and sort out the lease over the weekend and get back to us on the Monday. The Drive back to Portsmouth on Easter Monday was interesting as my wife had developed appendicitis, by early evening she was in Hospital awaiting the results of her tests. The mobile rang at 9.30pm with the news that if we wanted the shop it was ours but we had to take it on from 1st June, not sure what the male nurse who was fitting the DVT stockings to Hilary thought but we decided we would always regret not at least trying so said yes. Six weeks later we took over the running of Lerryn River Stores, Hilary having resigned after 17 years of working for the same company, recovered enough from the operation, me relocating Bournemouth Bantams along with all my Motorcycles and arranged for the house to be rented out. The first few weeks were a steep learning curve, having never run a shop or Post Office there was an awful lot to learn. The most difficult bits were sorting out the internet connection, arranging the national daily paper delivery and discovering that the predictions were correct, NO MOBILE CONNECTION FOR ½ MILE RADIUS OF THE VILLAGE. We are Three months down the line and loving every minute, we live in the most magical village surrounded by some of the nicest people I have ever come across doing a job we not only find rewarding but both enjoy. The pub may well be the hub of the village but the shop is the heart. If you fancy a Cream Tea, Cornish Pasty or Ice Cream come and visit two of the luckiest people in the country at the Lerryn River Store, Fore Street, Lerryn, Lostwithiel, Cornwall, PL22 0PT. D1 Bantams produced from 1948 to 1963 the longest production run of any model. Originally manufactured as a 123cc engine only, the first complete bikes did not appear until the end of 1948. Available in either rigid or plunger formats. Probably the most recognisable of all Bantams. 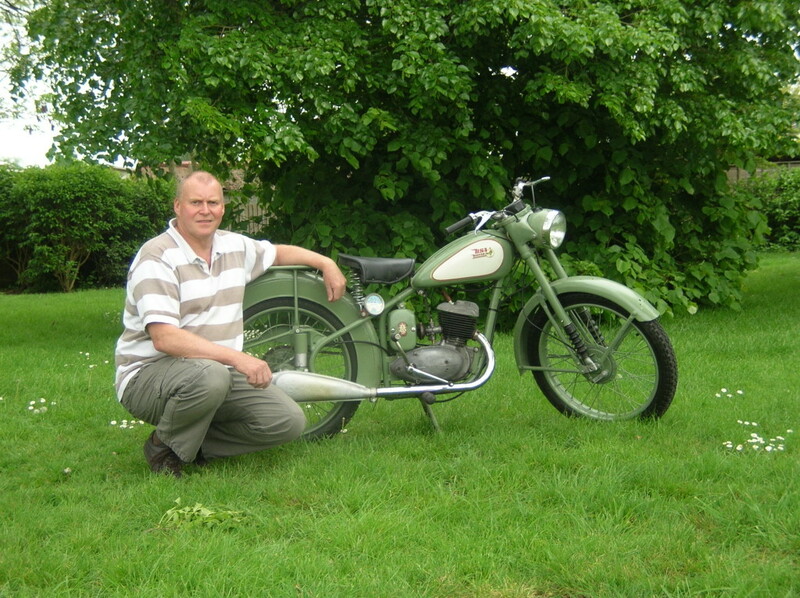 The bike featured is a 1954 plunger model purchased as a restoration project. This model is fitted with the first of the larger fin barrels with a 55mm stud pitch common to both the 125cc and 150cc, the previous year was the first large fin engines but had a 53mm pitch, the earlier bikes having the pineapple smaller fin engines. 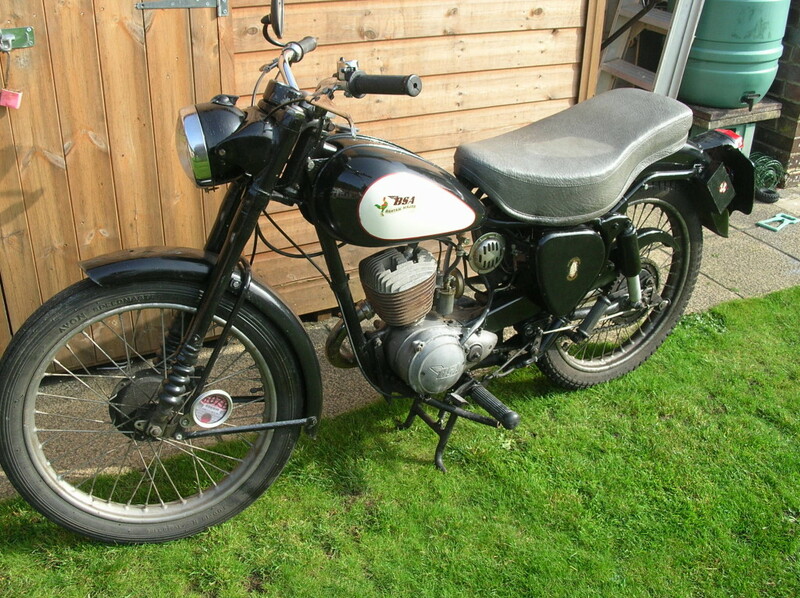 The 1954 models carried a new frame number sequence BD2s so are sometimes referred to as D2 bantams but as this same frame number sequence was also used on the plunger D3 it is debatable if the D2 designation was in fact used by BSA. Introduced in 1954 using the same basic plunger frame and engine as the D1. The engine being bored out to 150cc and heavier weight forks fitted. This model used the same BD2s frame number sequence as the D1 which ran in parallel. 1956 saw the introduction of the first swinging arm D3 model the plunger frame being dropped for this model but remaining for the D1. The bike was at this time given a D3 frame number designation.